The Great Square of Pegasus sparkles over your eastern horizon at early to mid evening. For some idea of the Great Square’s size, extend your hand an arm length from your eye. You will see that any two Great Square stars are farther apart than the width of your hand. 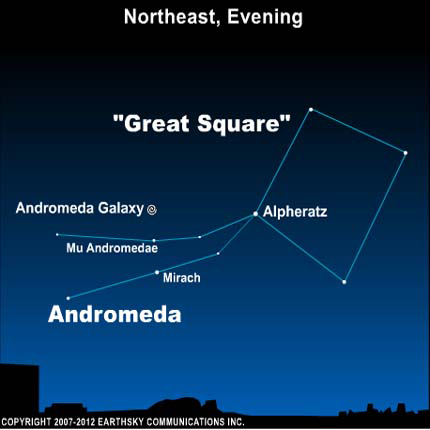 The Square of Pegasus is a great jumping off point for finding the famous Andromeda galaxy, also known to astronomers as M31. As seen from mid-northern latitudes, the Square of Pegasus looks like a baseball diamond whenever it resides in the eastern sky. Imagine the farthest star to the left – Alpheratz – as the third-base star. A line drawn from the first-base star through Alpheratz points in the general direction of the Andromeda galaxy. If it is dark enough, you will see two streamers of stars flying to the north (or left) of the star Alpheratz. 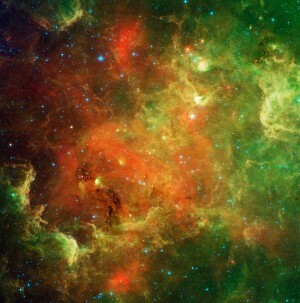 To me, this grouping of stars looks like a bugle or a cornucopia. Along the bottom streamer, star-hop from Alpheratz to the star Mirach. Draw a line from Mirach through the upper streamer star, and go twice the distance. 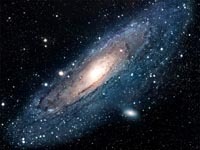 You have just located the Andromeda galaxy! If you can’t see this fuzzy patch of light with the unaided eye, maybe your sky isn’t dark enough. Try binoculars! Will Mars appear as large as a full moon in August 2009?